it would seem to align through from nose to finish; I am not sure what recommended that it be bottled as it is, perhaps this hot peppery spirit was suitably unorthodox and didn't need taming or perhaps it was for external use only. From the word go you get an aromatic and sharp scent. It feels very young, without much, if any, cask influence. Clearly a lot of alcohol in the nose. If you do not dive your nose too deep into the glass, you can get a collection of various citrus fruits and (to my suprise) wood. Vanilla, coconut, and pepper, which are often associated with oak extraction. It stays very hot, even with water. However, it also becomes more mint-ish, with mint tea, peppermint, and aniseed. Do I even smell some muscle rub? A positive note: the wood-y notes disappeared by the addition of some drops of water. A sharp arrival with plenty of alcohol punch, followed by drying tannins from the wood accompanied with coconut and vanilla. This certainly needs water… The alcohol storm lays down, the dram opens up and becomes very minty. Peppermint, tooth paste, mint cocktails, spearmint, mint balm, all cross my mind. I must say it is much better, but it still resembles to me simply, umm, a mixture of mojitos and muscle rub? A nice and young Aberfeldy, maybe some years longer in the cask? Nice sweetness and fruitiness. Pineapple and bananas notes. Some citrus and mint. Nice sweetness and fruity again like: ripe oranges and bananas. When you add some drops of water more citrus sweetness and flavours. A Little bit short. Vanilla and lime notes. A peppery spiciness in the end. Tropical fruits, most prominently pineapple and banana, with a bit of citrus and mint which I guess the "mojito" refers to. Sweet and again fruity, ripe oranges and bananas. Although this is a young whisky bottled at 61%, the alcohol isn't biting. When you swallow, there is a peppery spiciness in the back of the throat, but it doesn't last long. Water brings out more of the sweet citric flavours (lime). Relatively brief. Sweet with vanilla and lime. The oak doesn't show itself really. 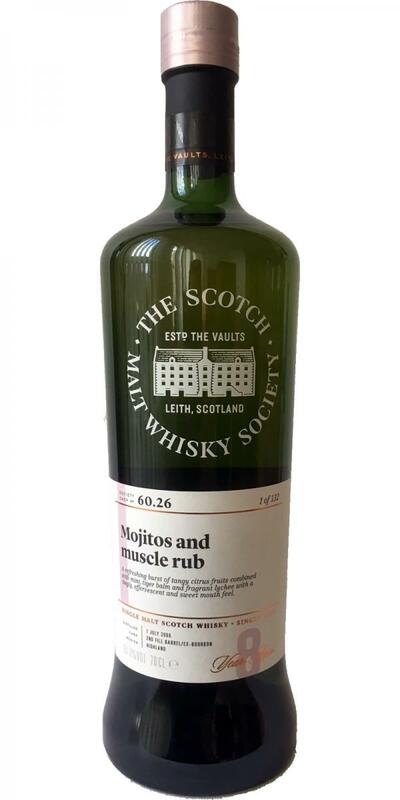 SMWS Tasting notes: An intriguingly fruity nose embraced the lime and mint of a refreshing mojito with dried pineapple, sweet orange and fragrant lychee. It became more floral and spicy as a dusting of talcum powder mixed with the invigorating fumes of tiger balm. Sticky sweetness was abundant with vanilla syrup, boiled sweets and wine gums. The palate was full of life with the effervescence of sparkling orange juice and the teasing tingle of English mustard. A lemon and lime skin tang followed and combined with slightly under ripe mango and green bell pepper to further its juicy appeal. Finishing sweet and with fine oak sawdust it was evident this was a very moreish dram indeed.